I had an enlightening email conversation with a 74-year-old fourth-generation Dutch beekeeper who has been in the apicultural business since he was 12. Now, that’s a lot of beekeeping! Even though he learned the craft from his father and grandfather, Evert Jan van Tongeren remains fascinated by new ideas and the latest insights into beekeeping. 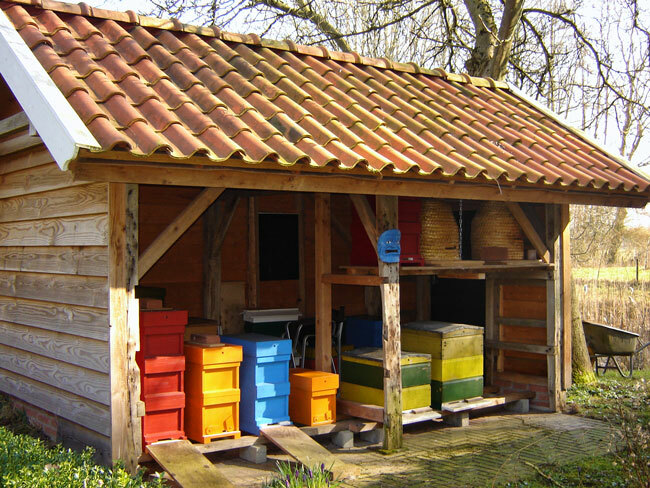 In a colorful juxtaposition of the old and the new, Evert Jan sent a photo of his bee house along with some of its history. He explained that the bee house was constructed of 200-year-old oak timbers salvaged from the old torn-down bee house of Hackfort castle, one of eight castles in his village of Vorden. “The ban-mask, with bees passing through its mouth, originates in pagan beliefs in which the soul was to leave the body through the mouth during sleep (dreaming) and at dying. It used to do so in the shape of a honey bee. Because swarm season is approaching, Evert Jan also sent me a copy of the Lorsch Bee Blessing, a magic charm intended to make a swarm return home. He said, “With the kick-off of swarming season it could come in really handy.” So, in all fairness, I will pass it on to you. Lorscher Bienensegen (the Lorsch Bee Blessing) sizi sizi bina (zeetsee zeetsee beena) is one of the oldest poems in the German language and was probably written in the 9th century A.D. in Old High German. The manuscript originates from the middle-or upper Rhine region and was kept in the Lorsch monastery. Since 1623 it is in the Bibliotheca Apostolica Vaticana (Pal. lat. 220, Bienensegen fol. 58 r). It relates to an apiary prayer scribbled down, upside down, in the bottom margin of a manuscript, in all probability by the resident beekeeping monk. In those days, bees were often kept at monasteries, to provide for wax (altar candles) and honey. As such they were considered extremely valuable. The poem’s purpose was to induce swarming bees not to disappear and to settle down quickly. Flying off into the woods in particular was to be discouraged. These swarms and feral hives were by early medieval law the property of the so called “Zeidler” (forest beekeepers). Appropriation of these bees was strictly forbidden and punishment was not to be smiled upon. It used to be harsh and cruel. The “Bienensegen” is believed to be a Christianized form of an earlier pagan spell. Christianity was only recently introduced all over Europe. i is to be pronounced as ee; u as oo and u at the beginning of a word as w.
Do cherish this poem. It’s a great help if you’re catching swarms! Thank you so much, Evert Jan! You have expanded my bee knowledge. Living next to a forest as I do, I will put this blessing to good use! 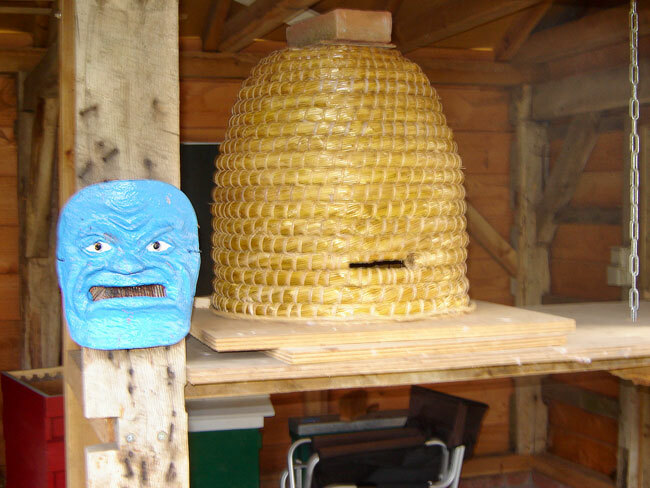 Bee house in Vorden with ban mask hanging in front of the hives. © Evert Jan van Tongeren. The ban mask was meant to cover the opening of the straw skep. © Evert Jan van Tongeren. What a great unique story. Thanks for sharing. With an early spring in the making and two very strong hives I slipped a honey super on each today. As I did so I thought that I really needed to reread your post on top entrances, perhaps this would be a good year to try them out. With no one in the area using a top entrance and also being a little judicious about changes, perhaps I need to create a mask to help insure a bountiful harvest. We had a very warm November and December and the bees consumed much of their honey reserve. Had it not been for your article on sugar boards which I implemented I really doubt these two hives would have survived. I’m glad the sugar boards worked. And yes, perhaps I need a mask as well. I am new to beekeeping. I want to make a split. Before doing it I have a few questions in my mind. 1. I want to make simple split, that is put few frames containing brood, honey and pollen into a box adjacent to original one. After a few days can I put one more frame of brood and bees. I mean will they be accepted there with and with out the presence of queen cells. 2. If queen is emerged not mated can I add brood to them to maintain population? 3. IF by some reason the split did not work can i recombine them directly? 1. You can add more frames of brood and bees even after the queen cells are built. 2. Yes, but be careful not to add a queen. 3. You will have to recombine using newspaper or some similar method to minimize fighting. How interesting! It’s sounds a bit like nailing a horseshoe above the barn door for good luck. Maybe I’ll put horseshoes on my hives at the entrance so they have to fly through it. 🙂 Also intrigued by bee house. Is that just for wintering bees, or are they maintained under cover all year? Thanks for sharing this. The different methods of beekeepers worldwide is fascinating. I’ve worked as a horse trainer and always had goats, dogs, cats, geese, ducks all my life. Two months back I got introduced to the world of bees and the art of beekeeping. The more I see them and the more I read up about them just fascinates me. Amongst all the information I’ve read and seen by way of videos, your site is the best of all. A very helpful and informative site with a very easy flow of information. Please keep up the good work and help us all novices to do a good job.